With each passing day, it seems like social media is becoming a more visual medium. You don’t just tweet a couple hundred characters, you add a card or image. You don’t just post a photo on Instagram, you add a video or story that creates a more interactive experience for users. Social media templates can help you create unique, visual posts that will engage your audience! How your social posts look communicate something to your audience about you or your brand. So it all has to be spot on. One tool that can make all this posting that much easier is to use templates to boost your social media presence. Here’s how you do it. Whether you create it yourself or download a ready-made template, a social media template can set a visual style for posts. Developing an identity on social media can be hard. You might put up a mix of images that show your message or brand, but do they consistently communicate what you are about? That’s where a social media template can come in hand. Whether you create it yourself or download a ready-made template, a social media template can set a visual style for posts. A template can help you stick to a font or color palette in images and for card-style posts. It can help you establish a feel – such as a color overlay on an image or most loved filter – that users connect with your channels and brand. A template can also help you connect the visual elements from your website or product packaging to social media so that everything you do, and everything you communicate, is visually represented in the same way. Users will associate that visual style to similar channels and help you grow a connection with that following. A visual social media style can include anything from colors and fonts to whether you speak with emojis (in the text or images), design frames or divots or even how (or if) you place a brand logo or mark on posts. One of the best things about social media templates is that they can help you work fast. One of the biggest complaints designers, freelancers and small business owners all have in common is that they often “waste” too much time on social media. There’s a lot of strategy and planning that goes into well-organized posting, but a template can ensure that you always have the tools you need to pop in an image or animation and a few words or just create a great image that you can share in just a few minutes. While there are a lot of tools out there to help you do just this, using a template will ensure that you’re comfortable with putting your content together quickly and that you are maintaining that consistent visual style that’s unique to your social media brand. Do you ever get frustrated by all the different size and shape specifications for social media posting? Not only does each channel have shape and size requirements that differ from each other, but Facebook alone has different specifications for a profile photo, cover image, event cover image, image post or video. An up-to-date template includes size specifications so that you can just plug your images or video and text into the proper locations, save and post. You won’t have to spend extra time Googling the latest specifications or creating something only to think it fits and then see it is out of whack on one device or another later. A good template designer has already taken this into consideration so there’s no guesswork for you. Just use the template to design your social media image and move on with other tasks. In addition to keeping you on task with size, look for a social media template that includes a similar design already sized for multiple channels. Look for a template that includes options for channels and types of posts that you plan to use the most. 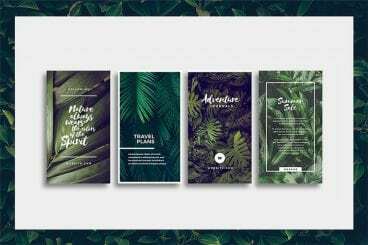 The Modern Social Media Post Bundle, one of the featured templates in our roundup of the best social media templates, includes 30 unique post designs in 3 different sizes: Square, vertical, and horizontal to fit all social networking platforms, including Facebook, Instagram, Pinterest and Twitter. Vector-based templates make it easy to change colors, resize and edit. This is what you should look for in a solid social media template.